Bill Belichick talked to the media to talk about his finding on the deflated football controversy. I want to take this opportunity to share some information. I spent a significant amount of time this past week learning as much as I could learn, more than I could ever imagine to tell you the truth, about bladders, air gauges, stitching, pressure, game day football preparation, rubdowns and so forth. [I’m] trying to be as helpful as I can here and share with you what I’ve learned. Having coached for 40 years in the National Football League, played for several years, growing up in a football family, being around this game my entire life, it’s clear that I don’t know very much about this area. Over the last few days I’ve learned a lot more than I ever knew – like, exponentially more. I feel like this is important because there have been questions raised and I believe now 100 percent that I have personally, and we as an organization, have absolutely followed every rule to the letter. I just feel that on behalf of everyone in the organization, everyone that’s involved in this organization, that we need to say something. I’ve talked to and gathered a lot of information from members of our staff, I have talked to other people familiar with this subject in other organizations and we have performed an internal study of the process and I think there are certainly other things that I can do and there’s maybe other research that can be done, but I say at this time, I definitely have enough information to share with you. So, based on the events of today, I feel like now’s the time to do it, rather than wait. I know this is kind of an impromptu thing, but that’s just the way it worked out. First of all, let me start with the process. As Tom [Brady] explained on Thursday, the most important part of the football for the quarterback is the feel of the football. I don’t think there’s any question about that. The exterior feel of the football is not only critical, but it’s also very easily identifiable. When I feel a football, I can feel a difference between slippery and tacky. I can feel the difference between the texture of the football to what degree it is broken in. If you put five footballs out there, which football is broken in the most, which football is broken in the least, that’s easy to identify. That’s the essence of the preparation. We prepare our footballs over time and we use them in practice. That preparation process continues right up until the footballs are given to the officials prior to the game. That’s when they are finalized, if I could use that word. I would say that in that process I’ve handled dozens of footballs over the past week. The texture of the footballs is very easy to identify. The pressure of the footballs is a whole different story. It’s much more difficult to feel or identify. So, the focus of our pregame preparation for the footballs is based on texture and feel. I think Tom went into that extensively on Thursday and he obviously could go through it a lot better than I can because he’s the one that touched them. But that’s the heart of the process. We simulated a game day situation in terms of the preparation of the football and where the footballs were at various points in time during the day, or night, as the case was Sunday. I would say that our preparation process for the footballs is what we do. I can’t speak for anybody else. It’s what we do. That process, we have found raises the PSI [pounds per square inch] approximately one pound. That process of creating a tackiness, a texture – the right feel, whatever that feel is, it’s just a sensation for the quarterback, what’s the right feel. That process elevates the PSI approximately one pound based on what our study showed, which was multiple footballs, multiple examples in the process, as we would do for a game. It’s not one football. 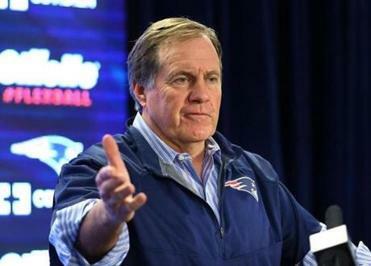 New England’s coach flatly denied any wrongdoing and explained the team’s gameday football preparations. When the footballs are delivered to the officials locker room, the officials were asked to inflate them to 12.5 PSI. What exactly they did, I don’t know. But for the purposes of our study, that’s what we did. We set them at 12.5. That’s at the discretion of the official, though. Regardless of what we ask for, it’s the official’s discretion to put them where he wants. Again, that’s done in a controlled climate. The footballs are prepared in our locker room, they’re delivered to the officials locker room, which is a controlled environment. Whatever we have here is what we have there. When the footballs go out on to the field into game conditions, whatever those conditions are, whether it’s hot and humid, whether it’s cold and damp, whether it’s cold and dry, whether it’s whatever it is, that’s where the footballs are played with, and that’s where the measurements would be different than what they are, possibly different, than what they are in a controlled environment. That’s what we found. We found that once the footballs were on the field over an extended period of time, in other words, they were adjusted to the climatic conditions and also the fact that the footballs reached an equilibrium without the rubbing process, that after that had run its course and the footballs had reached an equilibrium, that they were down approximately one-and-a-half pounds per square inch. When we brought the footballs back in after that process and re-tested them in a controlled environment as we have here, then those measurements rose approximately one half pound per square inch. So the net of one and a half, back to a half, is approximately one pound per square inch, to one and a half. Now, we all know that air pressure is a function of the atmospheric conditions. It’s a function of that. If there’s activity in the football relative to the rubbing process, I think that explains why when we gave them to the officials and the officials put it at, let’s say 12.5, if that’s in fact what they did, that once the football reached its equilibrium state, it probably was closer to 11.5. But again, that’s just our measurements. We can’t speak specifically to what happened because we have no way of touching the footballs other than once the officials have them we don’t touch them except for when we play with them in the game. But it’s similar to the concept of when you get into your car and the light comes on and it says, ‘Low tire pressure,’ because the car has been sitting in the driveway outside overnight and you start it up and you start driving it and the light goes off. It’s a similar concept to that. The atmospheric conditions, as well as the true equilibrium of the football is critical to the measurement. At no time were any of our footballs prepared anywhere other than in the locker room or in an area very close to that – never in a heated room or heated condition. That has absolutely never taken place to anyone’s knowledge or anyone’s recollection. That just didn’t happen. Footballs do not get measured during the game. We have no way of knowing until we went through this exercise, that this is really taking place. When we hand the footballs to the officials, the officials put them at whatever they put them at, but let’s just say it’s 12.5, that’s where they put them, then the air pressure at that point from then on until the end of the game, we have no knowledge of. Honestly, it’s never been a concern. What is a concern is the texture of the footballs and again, that’s the point that Tom hit on hard on Thursday. We had our quarterbacks look at a number of footballs. They were unable to differentiate a one-pound per square inch difference in those footballs. They were unable to do it. On a two-pound differential, there was some degree of differentiation, but certainly not a consistent one. A couple ones they could pick out, but they were also wrong on some of the other ones that they had. You’re welcome to do that yourself. I can tell you from all the footballs that I’ve handled over the last week, I can’t tell a difference if there’s a one-pound difference or half a pound difference in any of the footballs. Again, anyone who has seen us practice knows that we make it harder, not easier, to handle the football. Our players train in conditions that a lot of people would recommend that we not drive in. That’s what they do. They’re a physically and mentally tough team that works hard, that trains hard, that prepares hard and have met every challenge that I put in front of them. And I know that because I work them every day. This team was the best team in the AFC in the regular season. We won two games in the playoffs against two good football teams. The best team in the postseason, that’s what this team is. I know that because I’ve been with them every day and I’m proud of this team. I just want to share with you what I’ve learned over the past week. I’m embarrassed to talk about the amount of time that I put into this relative to the other important challenge in front of us. I’m not a scientist. I’m not an expert in footballs; I’m not an expert in football measurements. I’m just telling you what I know. I would not say that I’m Mona Lisa Vito of the football world, as she was in the car expertise area, alright? At no time was there any intent whatsoever to try to compromise the integrity of the game or to gain an advantage. Quite the opposite, we feel like we followed the rules of the game to the letter in our preparations, in our procedures, alright, and in the way that we handled every game that we competitively played in as it relates to this matter. We try to do everything right. We err on the side of caution. It’s been that way now for many years. Anything that’s close, we stay as far away from the line as we can. In this case, I can say that we are, as far as I know and everything that I can do, we did everything as right as we could do it. We welcome the league’s investigation into this matter. I think there are a number of things that need to be looked into on a number of levels, but that’s not for this conversation. I’m sure it will be taken up at another point in time. This is the end of this subject for me for a long time, OK? We have a huge game, a huge challenge for our football team and that’s where that focus is going to go. I’ve spent more than enough time on this and I’m happy to share this information with you to try to tell you some of the things that I have learned over the last week, which I’ve learned way more than I ever thought I would learn. The process, the whole thing is much more complex – there are a lot of variables that I was unaware of. It sounds simple, and I’m not trying to say that we’re trying to land a guy on the moon, but there are a lot of things here that are a little hard to get a handle on. Again, there’s a variance in so many of these things, alright? So, I’ll take a couple questions and then I’m moving on. Q: Did the NFL share with you the pregame documented PSI? BB: You would have to talk to the NFL about anything they did or didn’t do. Q: You don’t know if they documented it? BB: Look, we could sit here and talk about some of this stuff for two hours, alright? If you want to ask the league any questions about what they do or don’t do you should ask the league. I’m just telling you what I’ve learned and the study that we’ve done and the experience that I’ve had over the last few days in looking into this matter. That’s all I can tell you. I’m not a scientist and I’m not a league official. Q: Do you feel like after the amount of work and research you’ve put into this this week you’ll be exonerated from all this? BB: I just told you what I think. That’s what I think right there. Q: Has your game preparation been compromised at all? I know you usually spend this week in game planning. BB: Well, I’ve spent a lot of the week in game planning – a lot of this week, yeah. Q: Do you feel like any of it has been compromised? BB: Look, I told you: I thought this was an important issue and we addressed it, so we did. Q: It sounds like according to your simulation, it’s a combination of atmospheric or weather conditions and then trusting that the officials did inflate the footballs to 12.5 PSI. Is that correct? 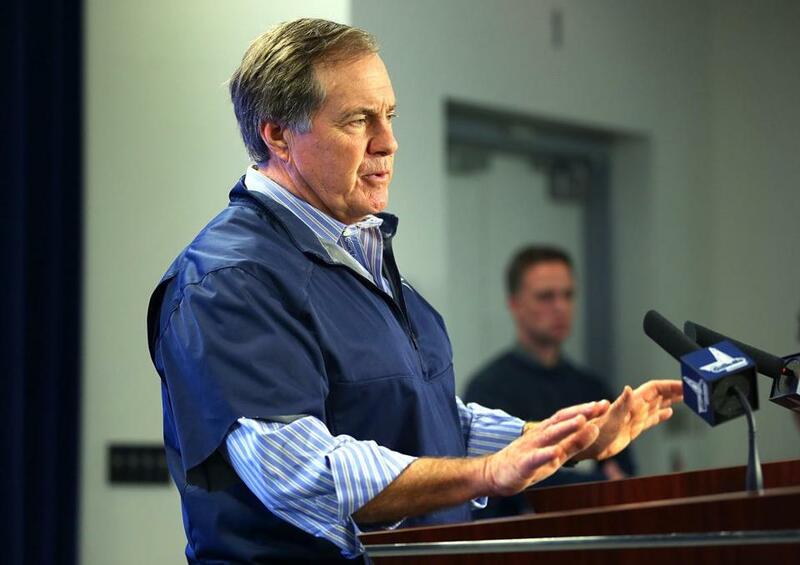 BB: Well, look, you can take the atmospheric conditions out of it because if the footballs are measured in the same atmospheric conditions then it’s a non-factor. But if you measure a football in a controlled condition like this and you measure a football on, let’s say, the night we played Baltimore, there’s no way they’re the same. You take that football and you set it outside and the football becomes accustomed to those climatic conditions and those temperatures, there’s no way it’s the same. Now if you take it out and bring it back in and let it sit for X amount of time, then it probably is the same. So no, that’s not the issue. But depending on where footballs were measured and how they were measured, that’s a whole other discussion. No, the situation is the preparation of the football caused the football to, I would say, be artificially high in PSI when it was set to the regulation, regulated level. And then it reached its equilibrium at some point later on, an hour, two hours into the game into the pregame, whatever it was – and that level was below what was set in this climatic condition. I think that’s exactly what happened. And I think that anybody who wants to do those experiments should go ahead and do them themselves. Don’t take my word for it. But I’m telling you, we’re trying to get an answer to this and that’s what we have. Q: You said you always try to err on the side of caution and stay on the right side of the rules, but with the videotaping it was clear that you were pushing the envelope on that. Is that something that changed that? BB: I mean, look, that’s a whole other discussion. The guy’s giving signals out in front of 80,000 people, OK? So we filmed him taking signals out in front of 80,000 people, like there were a lot of other teams doing at that time, too. Forget about that. If we were wrong then we’ve been disciplined for that. BB: The guy’s in front of 80,000 people. 80,000 people saw it. Everybody [on the] sideline saw it. Everybody sees our guy in front of the 80,000 people. I mean, there he is. So, it was wrong, we were disciplined for it. That’s it. We never did it again. We’re never going to do it again and anything else that’s close, we’re not going to do either. Q: So is that a change? I’m talking about what you said a few minutes ago about always trying to stay on the right side. BB: We always do. We always have. I mean, anything that’s even remotely close, we’re on the side of caution. Q: You talked a lot about science today. Did you have any science people help with your investigation? BB: We talked to a lot of people. Q: How much time did you spend on it? BB: I don’t know; I didn’t log it. Q: Are you relieved by what you’ve found in your investigation? BB: I didn’t – look, I came in here Thursday and I told you that I didn’t have any answers. I just – and I’m very confident in the things that we’ve talked about, the study that we did, going through with a fine-tooth comb, everything. I’m 100 percent confident in everything I’ve told you. That’s what I believe. That’s what I know. That’s what it is. I’m as transparent as I can be on this one, period. Q: Is that a yes that you feel relieved? BB: Look, I did what I did. No, I’m not using those adjectives. I told you what I did. That’s what it is. Q: Is there one thing that you did that caused it to raise 1.5 PSI? Did you put it in front of the heater? Did you put it in dryers? Do you know what it was? BB: No, it was never put in front of a heater. I just said that. Q: No, I’m talking about whatever you do to get the texture right that causes it to rise. BB: You rub it. You try to get the texture the way the quarterback wants it. Q: I’m just trying to establish what it was that made it rise. BB: I just said that and I said that at no time was the football ever put in any type of heated environment. Q: So you rub it vigorously? BB: We rub it to get the football to the proper texture. Yes, it’s – I mean, I don’t know what’s vigorous or what isn’t not vigorous. We’re not polishing fine china here; we’re trying to get a football to the proper texture the quarterback wants it to grip it. Does that stimulate something inside the football to raise the PSI? I would say yes, it does. Q: Based on all this research, then what do you do differently in the future to err on the side of caution? BB: Well that’s another – you’re getting into another whole area here. You’re getting into another whole area as it relates to the next game. Yes, that’s exactly right. I couldn’t. That’s exactly why this whole process was done: for that very reason. I don’t know the answer to that question, but that’s a very important question.